In 1954, Wilford L. Mann began his career in arboriculture when he saw a need in the community for someone to remove all the large elm trees that were dying from Dutch elm disease. In addition to helping preserve the surviving trees, this action provided the wood he needed to heat his home and keep his family warm during the cold winter months. 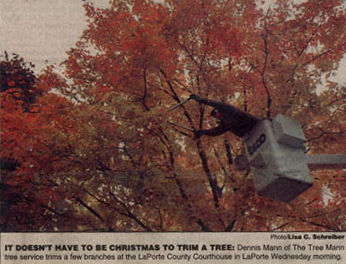 Through word of mouth, his reputation for quality service grew until in 1966 he was able leave his job at the telephone company and start a full time local tree and landscaping business with the help of his wife and three sons. His middle son, Dennis enjoyed the work so much he went to Purdue University and acquired a Bachelors degree in Forestry in 1971. After gaining experience in the logging business in Utah, Dennis brought his wife and first son, Brian, back to LaPorte to help grow the family’s tree business. Today Brian Mann, an International Society of Arboriculture (ISA) Board Certified Master Arborist and member of the American Society of Consulting Arborists, is continuing the tradition. Brian is now the president of the business and continues to expand the offered services and grow the business to an exceptional level of expertise. 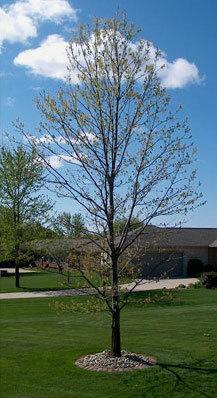 Along with the help of his youngest brother Zachariah and up to eight fulltime employees and leading arboriculture affiliates, The Tree Mann, Inc. continues to use the latest equipment, research, and techniques to care for the area trees in the best manner possible. All the pros at The Tree Mann keep up-to-date on the many different types of trees local landscapers and developers are planting. We understand that tastes change over time, so we make sure we know everything about the trees and shrubs coming into the area. Today, for example, fruit trees such as the Crabapple are gaining in popularity, as are Maples trees such as the Japanese Maple, Sunset Glory, and the October Glory. We maintain our expertise through Continuing Education (CE). CE keeps us current on new findings regarding pests and diseases, and keeps us in-the-know on all the latest equipment and techniques available to help you. The experts at The Tree Mann have over 130 years of combined experience helping people in the area. We’re members of arboriculture organizations such as ASCA, and have ISA-certified arborists on staff. Plus, we are a TCIA Accredited company since 2006, so you can be assured that the work we do for you will be of the highest quality and backed by a company known for excellence. When you’re out and around town as often as we are, you’re bound to get captured by the local media.